With the latest release of Tally.ERP 9 Release 6.4, you can easily generate and manage GST E-Way Bill in Tally. You can easily generate GST E-Way Bills in Tally by just creating the GST Purchase or Sales Vouchers. You have to enter necessary information regarding E-Way Bills at the time of creating the vouchers in Tally. That’s it. 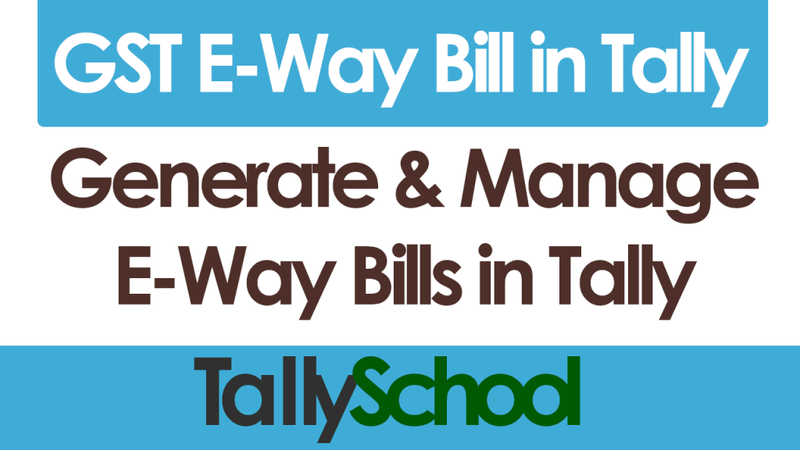 Nothing extra is required by you for generating and managing E-Way Bills in Tally. I am going to explain you everything about how to generate as well as manage GST E-Way Bills in Tally. But before that, let me explain you in short what is a GST E-Way Bill. E-Way bill is a document which is required when you are moving or transporting goods from one state to another state i.e. interstate movement of goods and the invoice value is ₹50,000 or more. Although, in some states, even inside the state movement of goods require an E-Way Bill. After creating a purchase or sales voucher in Tally, Tally automatically asks you to export the GST E-Way Bill JSON file. JSON is the standard E-Way Bill file format that is used to generate an E-Way Bill Number in GST in India. You have to upload or register the JSON file to the E-Way Bill portal and then the E-Way Bill will be registered and generated. You can print it and give a copy to your transporter and keep one copy with yourself. Now, we will move forward and see how GST E-Way Bill in Tally is generated and managed in Tally. Please note that the functionality of generating and managing GST E-Way Bills in Tally is only available from the Release 6.4 of Tally.ERP 9. Check your version of Tally and if it is below Release 6.4, please download and update the latest version of Tally.ERP 9. After you have downloaded and installed the latest version of Tally, here is how you can generate a GST E-Way Bill in Tally. Firstly, we have to create a GST Sales Voucher in Tally. This is because the information required for E-Way Bill in Tally is to be entered at the time of voucher entry in Tally. So, let’s create a GST Sales Voucher and I’ll show you the process of generating GST E-Way Bills in Tally alongside. From Gateway of Tally, go to Accounting Vouchers under Transactions. Then select Sales Voucher or press F8 – a Tally Shortcut. Select the appropriate Voucher no. and Date. Make sure the date is 1st February, 2018 or later otherwise you will not see the option of E-Way Bill in Tally at the bottom of the screen. Now, select the a Sundry Debtor to whom you are selling the goods. You can see the whole process of creating Sundry Debtors with GST in Tally here. Now select the Stock Item that you want to sell. Again, you can view the whole process of creating Stock Items with GST in Tally here. For our example, I have created a Stock Item called Samsung Galaxy S9 – 28%. I am selling 1 Samsung Galaxy S9 for ₹80,000. Sales Ledger will be Interstate Sales – 28%. You can go through the steps of creating a GST Sales Ledger here. GST will be Input IGST of ₹22,400. You can see it in the Tax Analysis below. This is how the Sales Invoice currently looks like. You have created the entire GST Sales Invoice. Now just press Enter and go to the option Provide GST/e-Way Bill Details and select Yes. You have to enter the required details for generating a GST E-Way Bill in Tally. Here is what it looks like after I have entered the details. I have blacked out the GSTIN because I have used origninal GSTIN. All the details with a star or asterisk * are mandatory so make sure enter all the information with a star. Let’s look at each of the option step by step. First option is E-Way Bill no. which we do not have so we will leave it blank. We will enter it at the end of this post. Second option is Sub Type which is mandatory. You have to select appropriate option for why you are transferring the goods. Most probably, the option would be Supply which will be selected by default. Third option is Date which is the date of your E-Way Bill you will register and print on the E-Way Bill portal. We will leave it blank for now because we have not generated the GST E-Way Bill in Tally itself. Fourth option is Document Type. This will be most probably Tax Invoice but you can select the option of your choice like Bill of Entry, Bill of Supply, Challan and so on. I have selected Tax Invoice since this is a sales voucher. These were the E-Way Bill Details. Now, we are going to enter the Transporter Details. First option is Mode of Transport. There are 4 types of Modes of Transport. Select the mode of transport through which you are sending the goods. In our case and in most of the cases it is by Road or by Rail. Second option after Mode in E-Way Bill details in Tally is Distance (in KM). It is also a mandatory option. In this option, you have to enter the distance calculated from the place of supply to the place of destination. In our example, I have taken 50KM. Next option is Transporter Name which is not mandatory but I recommend you create a ledger for transporter. Because when you create a ledger for transporter, you can track the details about the transporter. You can also pay to the transporter using the same ledger. Since the transporter will also have a GSTIN, everything related to GST could also be tracked and reported in Tally. The ledger for Transporter is created under Sundry Creditors in Tally. The GST details about the transporter are totally same as any other regular GST creditor. There is only one difference. 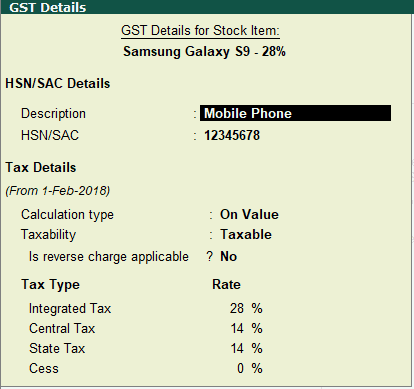 That is the last option in the GST Details screen. The option is, “Is a transporter?” and you have to select YES against this option. See the picture below to have a better clarification. Now, after you will enter the Transporter Ledger in Transporter Name option, the Transporter ID will automatically get filled up because that is GSTIN of the transporter. And that is because we have already put in the GSTIN of the transporter while creating his ledger. There is an option here this E-Way Bill Details Screen about the transporter if Road is Mode of Transport. You have to enter the Vehicle Number. I have entered the Transporter ID and Date in this example and therefore I leave the Vehicle Number option blank. But it is not mandatory to enter all of them. It is totally your wish. Date will be 1st February, 2018. There is one option in the Transporter Details which we have left. That is Doc/Lading/RR/Airway No. – RR No. means Railway Receipt which is used in Railways. Lading No. is used in shipping by sea ways. Airway No. is used obviously in transport by air. Doc No. means a simple document which is used in road transport. This is not a mandatory option at all and you can put the information if you have. The GST E-Way bill will be generated even if you don’t put in the details in this option. In this example, I am leaving the option blank to show you that the E-Way bill will be generated. This is how it looks like after you have put in all the information in Transporter Details while creating the E-Way bill in Tally. Let’s move ahead to the next section of E-Way bill details in Tally which is Consignor Details (From). In this section you have to enter your own details as consignor is the one who sends goods and consignee is the one who receives the goods. That’s why there is From in brackets for Consignor Details. Now, if you are not seeing the Consignor Details in your Tally, you have enable it. It’s easy to enable it. Press F12 or click the Configure button on the bottom right corner of Tally. You will see 2 options as shown in the menu. Look at the picture below. Select YES against the second option – Show consignor details. Press Enter and now you will see the Consignor Details. These are your company details and they are automatically picked up from the Company master. You must have entered the information like Address, State, GSTIN while creating your company. So, what’s the point of enabling this option here? Well, there are some mandatory details that are required to fill in for generating an E-Way bill in Tally. And, if you don’t enable this option, the details will still be picked up for E-Way bill in Tally but you won’t know if all the mandatory details are filled up or not. Most probable option that people forget to enter while creating a company is Pincode. If you look at the Consignor Details, Pincode is a mandatory option. To avoid this, it is better to enable the option of Consignor Details while creating an entry for E-Way bill in Tally. First option is Consignor which will be automatically filled up and you will see your own Company Name because in this case, you are the consignor. After that, there are two options which are not mandatory but you can enter the details because it is your own address that you have to fill. Those two options are Address – 1 and Address – 2. I have entered the address which is of course a fake one but hilarious. I have left the Address – 2 as blank but you can enter the address if your address is long. The third option in Consignor Details is Place which is again not mandatory but I have entered it as Delhi. You can enter anything here as you want but I recommend you to enter city or village you are in which is what generally people have in mind when they hear the word place. Fourth option is Pincode and it is mandatory. Enter your pincode. Fifth option is State so enter your state. This is also a mandatory option. Sixth option is GSTIN/UIN which is of course, a mandatory option. Enter your GSTIN or the UIN. We have successfully filled in all the Consignor Details and now we will move on to the next and the last option i.e. Consignee Details (To). The interesting thing about Consignee Details is that all of the options in this menu are exactly the same as Consignor Details. You have fill in exactly the same details but this time the details will be of consignee which in normal language is our debtor. You can have a look at the picture above and see how I have filled in all the details. It almost similar to Consignor Details. So, we have filled in all the E-Way Bill Details in Tally and now we are ready to export it and upload it to the E-Way Bill portal to generate E-Way Bill number. We will press Enter to move forward. After pressing Enter the selection will be on the total amount of the voucher which in our case is ₹1,02,400. Press Enter once again and you will be taken to Narration option which you can write if you want to but I’ll leave it blank. After Narration option when you press Enter, you will be asked to Accept or Not. If you have entered any of the E-Way Bill information incorrect or if you have missed any of the mandatory information, you will see a warning by Tally. It says, Invoice details cannot be exported. 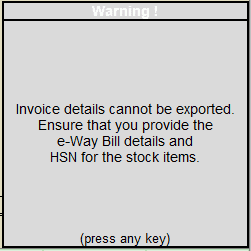 Ensure that you provide the e-Way Bill details and HSN for the stock items. Check all the E-Way Bill Details and make sure that you have entered all the information correctly and you have filled in all the mandatory details. Once, everything is correct, you will not see the warning and you will be asked to Accept or Not. Press Enter and you have successfully created GST E-Way Bill in Tally as well as the GST Sales Entry with E-Way Bill in Tally. Next step is exporting E-Way Bill in JSON format. 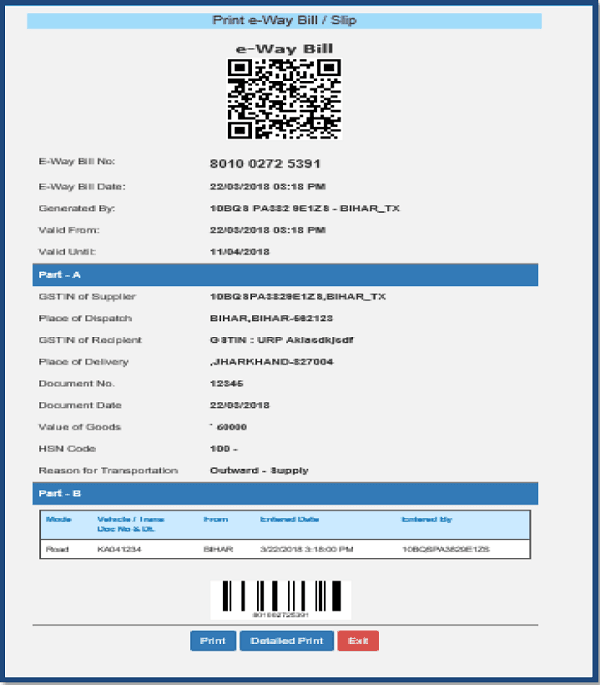 We have created the entry and filled in all the necessary E-Way Bill details in Tally. Now, Tally will automatically ask you to export the details for E-Way Bill in Tally. 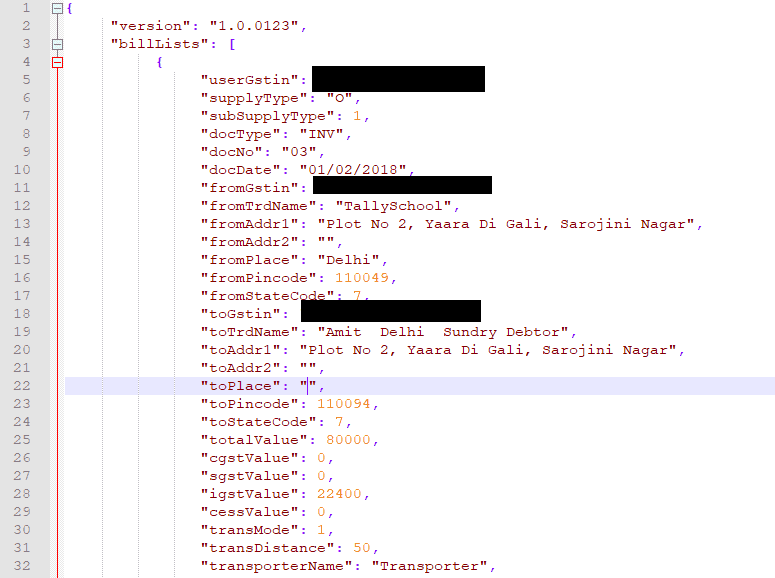 This is nothing but a JSON format file which you have to upload on the E-Way Bill portal to generate an E-Way Bill number. It is this easy to export a GST E-Way Bill in Tally. Press Enter to export the file. This is how the exported JSON file will look like in Notepad ++. Now, you can easily upload this JSON file at the GST E-Way Bill portal and generate an actual E-Way Bill Number. After you have successfully generated an E-Way Bill Number on the GST E-Way Bill Portal, you have enter that number in Tally. You will see a window like this immediately after you have exported the above JSON file. Enter the GST E-Way Bill Number in here and press Enter and save it. Now, you have successfully created an entire GST E-Way Bill in Tally. This was a long post and if you have read till here, I salute you. It shows how much you are interested in learning about GST E-Way Bill in Tally. Tally is a vast and big software and therefore it can happen that how I have described E-Way Bill in this post, you may not find it in the exact same way. So, if you have any difficulties in understanding the post or have any kind of questions, please comment down below. And, if you liked how I explain, please share this post. Thanks for sharing this informative information regarding . I would like to know if the automatic generation of waybill was implemented. In Tally, you cannot implement automatic generation of e-way bill but once you fill in all the details, the process is 99% automatic because Tally picks the information from the previous entries. So, after the first entry, you have to just look at the data and press Enter and move ahead to create an e-way bill in Tally. Also, you can manage bulk e-way bills in Tally too by way of e-way bill reporting. The latest version of Tally is called Tally.ERP 9 – Release 6.4.8. There is no 9.1.1 or 6.1.1. I want to learn more about GST in Tally. I have basic knowledge about Tally . What course should I prefer? Plzz suggest me. You have already the joined the Free Tally Course which also includes the GST lessons. It is perfect course you have joined. No need to join any other course. Respected sir i am a big fan of you i wanted to download this chapter in PDF how can i get that ? You cannot download ths chapter in PDF. You can read this page anytime you want for FREE. helo sir videos super iam alrey learning this videos and iam useing tally verstion is 6.4.6 please tellm me sir how many days sir your giving a tally certificats and exams date tell me sir tallyy certificats giving sir thanjks …..
You will get the email for the test. when i am uploading json file on gst portal ,getting error invalid file name. That was the error which was coming up in Tally. Update your Tally to the latest version and you will not face the error. Bro here u have created something which is of great help. I have doubt can I start this course again as I am busy for next couple of days like after a week and will that tally educational software be operational till that time. You can start the course at any time you want. Just save those emails and go through them. Tally Educational version can be used for life time. Sir .Mera email par lesson 3&4&7&8 nhi aaya ha. Plz send krna ki kirpa kara. Aapko send kar diya hai. Please check kar lijiye. Can you please tell me about HSN code? The full form of HSN is Harmonized System of Nomenclature which simply means a system which assigns a number to a specific product. This is used in GST to differentiate products so they can taxed at a appropriate GST rate. 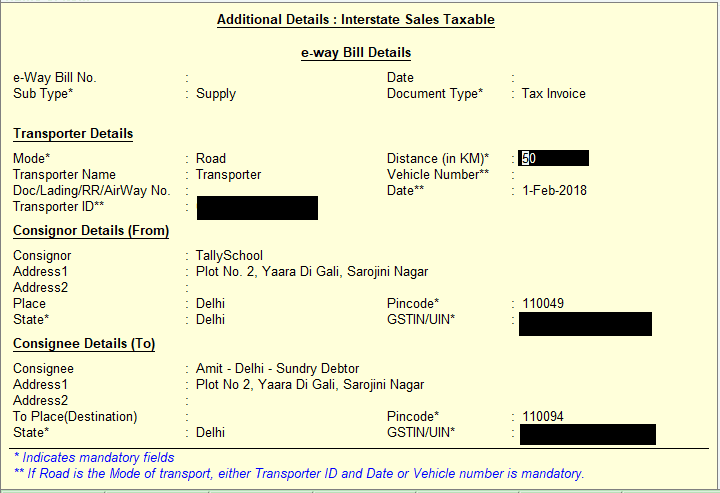 The process for entering e-way bill on purchases is exactly the same as you enter it while creating a sales voucher in Tally. Input IGST ledger is wrongly selected in SALES Invoice . Technically it is not wrong but we use the Input for purchases and so it might seem wrong. Next time, I will keep this in mind. Please make sure, your GST options are on in Tally otherwise it will not show the e-way bill option. Also, if the amount of invoice is less than ₹50,000, then too it will show not show the option because e-way is not applicable on invoices less that ₹50,000 in GST. I want tally all notes so from where I can get it?? How does I creat e way bill for credit note ???? The process is exactly the same as you do in purchase voucher. Just, select credit note and do the entry. I was not able to create a new transporter under sundry creditors. The option “Is a transporter” is not showing. Can you say is it any add on required to create and maintain transporters list. No, it is not an addon for maitaining the transporters list. The option of “Is a transporter” will show if you have properly configured GST for Tally in the Statutory & Taxation. i have modified it as per the instructions but still could not find it. Make sure you are using the latest version of Tally. Also, sometimes people trying to use GST in tally, enable or disable options at different places and that is hard to make it original. What I suggest is create a new company and hust try to enable GST and create a sundry creditors ledger and see if there is an option of Transporter. 99%, you will find it. If that is the case, then try to look at all places where there are different GST options in Tally. Make sure, you have not changed them. This is for kind attention that I am not received any lesson since 27th January 2019, last lessons I received Lesson No 13,14 & 15. I will be grateful if you send me the lesson I am waiting for your reply. There was a glitch in the email service therefore, you might not have received any lessons. I will be sending you an email once the service is fixed. You will get all the information in that email. This question is not related above video. But I would like to know how we can change Server. For example, I am installing in computer A as server with Gold licences but I want to change computer B. How should I do sir? Please kindly guide line to me. You have to configure the server settings in tally for that. From gateway of tally, go to configure by pressing F12. Then, go to advances configuration. Now, the first option is about server. Choose client on the computer you want to set as client and server on the computer you want as server.